Check the blog post above. It’s a great example of thinking of a problem in a different light, and solving it differently. 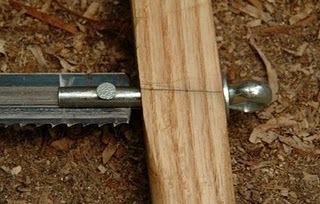 I always thought that frame saws usually required pins like these which I actually just purchased recently, or making your own out of bolts with a hack saw. However, this solution is much more elegant and cheaper for casual use. I could even see mounting these in a handle with a cross pin, or not. For a bang together saw frame it’s just fine. I love to just wander through hardware stores from time to time, just see what’s there. There is always some little thing sitting dusty on a shelf somewhere that is interesting or neat.